Are you someone who gets excited by seeing the intricate designs or the word Textile seems interesting to you? Then you have come to the right place. Sand Pebbles’ Textile Tours Odisha offers you a variety of ways to explore Odisha’s unique textile world. India is one of the cheapest countries in terms of cost competitiveness of the materials. Odisha has a long history of the textile industry. The handlooms of Odisha have gained worldwide acclaim and reputation for design and quality. Various designs have existed in Odisha such as Sambalpuri, Bomkei and Berhampuri. Odisha is also famous for its Ikat type of weaving. You can indulge yourself in these with the help of Textile tours Odisha. Textiles are cultural artefacts that reflect the social histories of the places where they originate. Textiles in India vary from place to place dramatically, not only in terms of the type of material or cloth but also in design, manifesting in them the diversity in geographical and ethnic cultural patterns. Sand Pebbles’ Textile tours Odisha will ensure you have the perfect experience of textile artefacts and apparels. 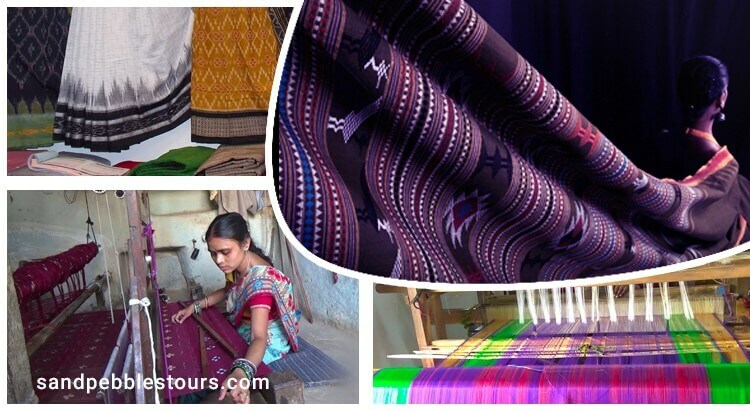 Our Odisha Textile Tour Packages are best for people who are textile and apparel enthusiasts and wants to explore the textile industry of Odisha. It is a 14-day tour programme and covers Bhubaneswar, Nuapatna, and Maniabandha famous for Olasingh Textile Village, Chikiti Textile Village, Sambalpuri Textile Villages around Sagarpalli and Buttupalli, Barapalli Textile Village, Attabira Textile Village, Sericulture Projects, and Tussar Silk Village. You shouldn’t wait to experience this beautiful Odisha Textile Travel. Pack your bags right away, and leave rest of the thing to us. Meet & greet upon arrival at Bhubaneswar Airport/Railway Station & then transfer to pre-booked hotel. If time permits, visit of oldest temples of 07th Century AD to 12th Century AD. Overnight at Bhubaneswar. After breakfast drive to Dhenkanal en-route visit to Nuapatna (IKAT Weaving village) and Sadeibarini (Dhokra Casting Village). Overnight at Dhenkanal. After breakfast drive to Sambalpur.Afternoon visit to some local weaving village. Overnight at Sambalpur. After breakfast proceeds to Balangir via Bargarh Weaving Villages and Barpali Silk Weaving Villages(the villagers of Barpali are the best craftsmen of Tussar Silk). Overnight at Balangir. After breakfast visit to Sonepur Weaving Village. Overnight at Balangir. After breakfast drive to Gopalpur via Padmanavpur Weaving Village. Overnight at Gopalpur. After breakfast drives back to Berhampur Railway Station/ Bhubaneswar Airport for onward journey.